Blog Post (7/4/18): What Happened To Locutions To The World? COMMENT (By a soul): Although there are no new locutions as of Fall 2015, below are heavenly messages from different sources that might interest those who follow Locutions To The World, as well as some of the commentaries that I have recently written. God bless! 12/27/16 – People have different reasons for their interest in Locutions To The World. Some are attracted to the prophecies, while others may be attracted to the spiritual teachings, etc. The reason I believe in the Locutions is the spiritual truths that Our Lord and Our Lady have revealed through the messages. If you are like me, you might appreciate the heavenly messages at Holy Love Ministry (http://www.holylove.org). I am always studying them as I consider them to be a treasure trove of spiritual gems. On this blog, I have collected various pages of Holy Love messages that the Holy Spirit has inspired me to study. Here are links to some of these pages for those who might be interested in these spiritual teachings. God bless! Blog Post (11/3/16): INCREDIBLE Holy Love Message from Blessed Virgin Mary! Mentions Hillary Clinton’s Emails and Wikileaks! I am still waiting to receive the prior messages for Locutions To The World, but I hope to have them soon to upload. Meanwhile, I do receive many visitors a day to this specific page whom I suspect desire to read the previous messages. Two months ago, the Holy Spirit placed it upon my heart to start uploading many of the locutions to this blog for “safe-keeping” because the main website was under hacker attack. Unfortunately, I wasn’t able to finish before the main website went offline. But, what I was able to upload, I organized by theme. So, it might not be readily apparent, but there are many dedicated pages to the locutions on this blog. In fact, almost all the pages under the blog section, “Life Of Our Lord – Jesus Christ” are 2012 locutions from Jesus and Mary. I’m also providing below links to specific pages already existing on this blog where you can read many of the locutions. Excerpts from a love-letter explaining Locutions To The World to an unnamed party. Written September – October 2014 by a soul. And so, I move on, to the topic of why Our Lord wanted me to write to you today. For the past three months, I have been immersed in prayerfully studying and discerning heavenly messages that have spoken to my heart and my soul. I have uncovered the final stone of Our Lady’s Great Plan for converting souls and saving the world. And it is because of this very reason that I am writing you this love-letter today. By true grace and an amazing circumstance of divine providence, in August 2014, I came across a body of heavenly messages from Our Lady to an unknown locutionist who lives in Pennsylvania. One day, I came across a few intriguing messages of unknown origin and, recognizing the voice of Our Lady, I scoured the internet to locate their unnamed source. The messages appeared to have a very small audience and are not very well-known at all. But, immediately recognizing their spiritual fruit, I delved into reading each and every one of them, which seemed to total over 900 or more since late 2010, as I discerned their truthfulness and authenticity. The locutionist is unknown, but the chosen soul has received private messages since 2005 from Jesus and Mary and, since December 2010, the messages have been public in nature. I also learned through the website that the spiritual director is a very well-respected devout priest. And as I discerned each heavenly message, I realized how much satan had pulled the wool over my eyes these past years. Locutions To The World were the final piece of the puzzle that brought sharp clarity and immediate sense to everything I had learned and understood about Our Lord and Our Lady’s Plan of Salvation and Their workings in the world. I consider myself so blessed and so humbled to have found these messages. I fully credit Our Lady for leading me to them. It was truly divine grace alone. Most people do not realize that the modern technique of abortion and widespread governmental acceptance of abortion first happened in Russia after the Bolshevik revolution in 1917. Although historical and worldwide statistics are not precisely known, at least since 1980, there have been more than 1.3 billion abortions in the world (the total number of people living on earth is 7.2 billion). This number far exceeds any number of human lives lost by war and is the number one reason for the negative population growth rates experienced in a number of countries. Many in the [Marian] movement and other devout persons believe that the Consecration of Russia asked by Our Lady in 1917 for the Pope in concert with all the Bishops took place in 1984. However, this widely accepted notion is a fallacy. The worldwide consecration in 1984 produced many good fruits, including the collapse of communism in Eastern Europe, but it was not the Consecration of Russia that Our Lady particularly desired. This request and the fulfilled promises of peace still stand suspended in eternity, waiting by Our Lady and Our Lord to take place on earth by the Catholic Church. Yes, this realization might be hard to readily accept by [unnamed party], but once, accepted that the specific Consecration of Russia did not take place, it explains the chain of events taking place in the world and reveals the hidden plans of satan and the goal that he is seeking to achieve in the world today. The Locutions are very plain and very clear and specific on this point. satan’s plan is to achieve maximum suffering, despair and death. his goal is to turn earth into another living hell by worldwide nuclear war. he counts every single nuclear bomb in the world today and knows how he wants to use each one for maximum destruction. he is not simply satisfied with conventional weapons and current methods of chemical and biological warfare. he desires the widespread use of nuclear weapons. satan’s goal is the annihilation of all nations on earth. Our Lady is adamantly opposed to his plans. Our Lord and Our Lady do not desire the annihilation of nations. If this takes place, it would set-back the Divine Plan of Our Lord by centuries and the True Faith would become extinguished on earth. Our Lady has also revealed that the many millions of people who would die by nuclear weapons would be lost to hell. This is because death by nuclear weapons does not allow time for heartfelt contrition and forgiveness of sins, as illness and other forms of suffering and death do. Comment: This shows the effects of these events upon world leaders at a moment when all the world is in distress. The crises are solved by heaven changing hearts of world leaders. All of these locutions, extraordinary as they are, merely reveal the full effects of Lucy’s vision of the death of the Holy Father (July 13, 1917). The Pope described in these locutions is not the current head of the Catholic Church. Mary’s Pope is an unknown priest in the world, who will rise to the head of papacy through an extraordinary intervention of Heaven and this pope will owe everything to Our Queen. He is fully consecrated to Our Lady and has lived in the light his entire life, but is hidden now. When Mary’s Pope comes, he will have two goals of his short papacy. One, the worldwide consecration of Russia to Our Lady’s immaculate Heart and two, the unification of Christianity and Israel through his sacrificial death in Jerusalem. Comment: Our Lady returns to the Fatima vision of the death of the Holy Father, a vision given to Lucy on July 13, 1917. 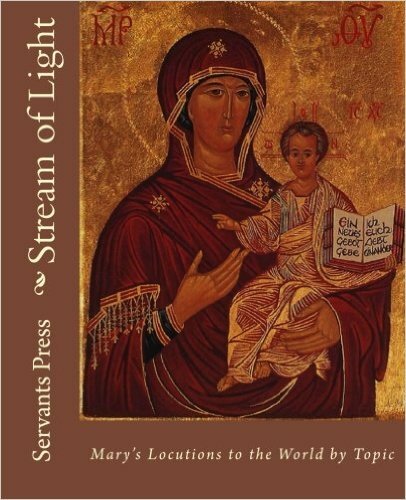 In Locutions To The World, Our Lady asks us to invoke Her as The Woman Clothed With The Sun as revealed in Chapter 12 of the Book of Revelation. It is an image She recalls frequently throughout The Locutions. Our Lady also reveals deeper mysteries hidden in Chapter 12. This image of Our Lady always intrigued me. The Woman, Clothed With The Sun, giving birth to her male child. It seemed obvious that the Woman is the Blessed Mother and the male child is Jesus, but several verses never made sense to me until I discovered The Locutions. Firstly, that the Blessed Mother “wailed aloud in pain as she labored to give birth.” This always caught me as odd, as the Birth of Christ was wholly miraculous–it was a Virgin Birth, in which the Blessed Mother never felt pain, had contractions, and never shed any blood. So, I would wonder how the Male Child that she is giving birth to would be Jesus? And then, Chapter 12 in Revelation tells us that immediately after Her Child was born, He got caught up to God and His Throne. 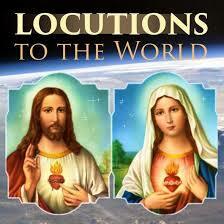 As for the Blessed Mother, She fled into the desert (wilderness) to be taken care of by God for 1260 days. But, this part also never made sense to me, because Holy Scripture and the Church tells us that after Jesus was born, the Blessed Mother fled with her Child shortly thereafter to the desert (Egypt). 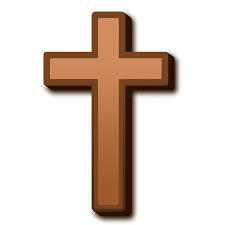 Jesus did not return to His Heavenly Father until He died on The Cross. So, this inconsistency always bothered me, too, because the sequence did not quite make sense to me. However, through reading The Locutions, the Truth of this passage of Holy Scripture finally dawned on me. Upon reading these passages (and other Locutions), I have realized many things. 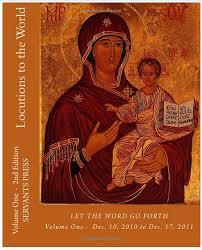 Firstly, in Chapter 12 of the Book of Revelation, the Blessed Mother is pregnant with child, but not simply with Jesus. The Woman at the Cross, Our Lady, is portrayed in Chapter 12 as The New Eve. I have learned in other Locutions, that at the Annunciation, when The Holy Spirit overshadowed the Blessed Mother, the Heavenly Father left two very precious gifts for humanity in Her Womb. The first was His Most Precious Son, Jesus Christ. And the second? It is the Divine Light of Christ in Her Immaculate Heart. This is a great mystery. There is a precious gift that is waiting for each of us from Our Lady in Her Heart. Right now, the flames of hell are springing forth in the world. 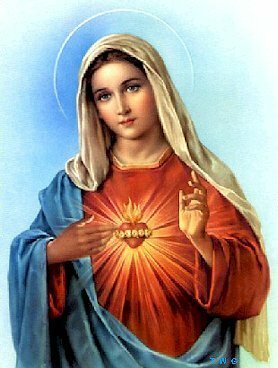 But, the answer to “fighting fire with fire” lies in the Immaculate Heart of Mary. In Her, are all the heavenly fires meant to quell the demonic fires of hell and defeat satan. Thus, when read and understood in this way, as revealed by The Locutions, Holy Scripture finally makes sense in Chapter 12 of the Book of Revelation on the sequence of events. Our Lady is pregnant with us as Her children at The Cross. Our Lady is in pain and suffering, because within Her, She is carrying all the graces—the Divine Flames—meant for the entire human family. And She “wailed aloud” through the heavenly messages today to explain what was happening. Also, in the same October 8, 2014 message, Our Blessed Mother reveals more great mysteries hidden since the time of Christ. She illustrates further the gifts of the Holy Spirit that are meant for the whole world. And when I read this passage, it made me greatly ponder and so, I prayed to Our Lord for greater insight. Was this a second “Fiat” by Our Lady? What does it mean to be “plunged in the Holy Spirit,” which took place at Our Lady’s Immaculate Conception? And so, I began to realize that when Our Lord was dying on The Cross, He entered into and was plunged into the Great Mystery of the Immaculate Conception. For Our Lord was to be The Savior of Our Lady, too. Here, the great mystery of Our Lady’s Redemption was revealed. The Heavenly Father saved Our Lady through the Merits of Her Son’s Sacrificial Death on the Cross. Jesus entered into the Mystery of the Immaculate Conception on the Cross for Our Lady and, in effect, for all of us. As Jesus died, He bore upon Himself all the sins of humanity and was plunged into the Immaculate Conception of Our Lady. Thus, He carried ALL of humanity to the Heavenly Father. And through the Mystery of the Immaculate Conception, Jesus shared in this gift given to Our Lady, the rising of eternal life in Her womb every child of Adam. Jesus became the New Adam and Our Lady, the New Eve, on The Cross. And so, Our Lady was given to us by God to be Our Queen not only, because She is the Blessed Mother of Our Lord and we are the spiritual children of the Father (and thus, brothers and sisters of Our Lord), but because, TRULY, we are born from Our Lady’s Immaculate Womb, just as She bore Her Divine Son. The Queen is TRULY Our Mother. Not simply sharing once in our redemption with Jesus’ Sacrificial Suffering and Death on The Cross, Our Lady accepted in Her second “fiat” to God, a role of continual suffering with Her Son, as She would bore every child of Adam into eternal life with Him. Thus, She is Our Mother of Sorrows, until the end of time. Truly sharing in all our pains, sufferings, and sorrows, Our Lady is TRULY Co-Redemptress with Our Redeemer, Her Divine Son, Jesus Christ. The New Adam and the New Eve. It must be reiterated, that at Holy Love Ministry (http://www.holylove.org), we have been given by Heaven the most concise and most direct spiritual path of holiness and sanctity through The Most Sacred Chambers of The United Hearts of The Most Holy Trinity and The Immaculate Heart of Mary. It is in this treasured gift—this treasured journey—that we can most easily be bestowed the Seal of the Immaculate Conception, which is the right and privilege due to every child of Adam. The Seal of the Immaculate Conception is part of our inheritance from The Heavenly Father. Through the continual Flame of Holy Love from the Immaculate Heart of Mary, which burns away all iniquity and self-love, we eventually reach the Ultimate Gift that Our Heavenly Father desires to bestow on every soul–Immersion in His Divine Will—the Highest Heaven and the Sixth Chamber of the spiritual journey through The Most Sacred Chambers of The United Hearts at Holy Love. And so, as I come to the concluding parts of my love-letter, I share this Locution with you. I have written before in a previous love-letter how special the tilma of Our Lady of Guadalupe is. Seeing the heavenly image of the Blessed Mother as the pregnant Woman, Clothed With The Sun, the image lead to the greatest conversion of hearts in the history of the Catholic Church. Our Lady of Guadalupe is the great defender for the pro-life movement in the world, meant to defeat abortion and other attacks on the dignity, preciousness and sanctity of life. Oh, it is to the foolish irony of mankind, that the salvation of the current disobedient and disbelieving selfish world immersed in the culture of death is found in the precious gifts left behind by the Unborn Child of Jesus in the Immaculate Heart of the Blessed Mother! Shame to us and yet, also, such Great Love of God and True Hope! The Great Answer and Antidote of Heaven to today’s apocalyptic darkness was planted 2000 years ago by the Holy Infant Child–safely hidden, tucked away, for the special moment to be revealed and unleashed when the world would be on its knees wondering if God had finally abandoned the world to the depths of hell! And so, it becomes self-evident that the “Hail Mary prayer” is THE prayer of the Pregnant Woman of Chapter 12 of Revelation, the Woman Clothed With The Sun, Our Lady of Guadalupe… Especially as Our Lady is invoked through the Rosary of the Unborn, given to us by Heaven, through Holy Love Ministry (http://www.holylove.org). The special Rosary that saves an unborn infant with every Hail Mary prayer. Further, the heavenly gift of The Seal of the Immaculate Conception, as revealed by Our Lady through Locutions To The World, reaffirms the sanctity of life. The Seal of the Immaculate Conception is what makes possible the spiritual journey provided for at Holy Love Ministry. Comment: In these days of great darkness, Our Lady opens new gifts. For the ways of Our Lord are high above ours and are unknowing and inscrutable and a great mystery of Divine Love in the conserving Plan of Salvation for humanity. I fully trust in the words of Our Lord and Our Lady, Who have said that They have many plans to touch the hearts of sinners in our world today. However, that being said, I also believe that the torch of Fatima which has been handed to me by knowledge and discovery of these Locutions is not meant to end with me. No, the continual flame is not meant to be carried by me. The torch of Fatima is meant to be carried by you, [unnamed party], to all lovers of Our Lady and Our Lord. I pray for your open hearts. I pray for your discernment of The Truth. I pray for your holy calling before God. I pray that you will realize the great value of The Locutions given by Our Lady on the Fatima gift. We are in a time of very special graces. Mary is trying to save souls and she needs helpers. Summary: Diversity of graces among the faithful to build up the Body of Christ being unified to practice the Truth in love. And he gave some apostles, and some prophets, and other some evangelists, and other some pastors and doctors, for the perfecting of the saints, for the work of the ministry, for the edifying of the body of Christ: until we all meet into the unity of faith, and of the knowledge of the Son of God, unto a perfect man, unto the measure of the age of the fulness of Christ; that henceforth we be no more children tossed to and fro, and carried about with every wind of doctrine by the wickedness of men, by cunning craftiness, by which they lie in wait to deceive. But doing the Truth in charity, we may in all things grow up in Him who is the head, even Christ: from whom the whole body, being compacted and fitly joined together, by what every joint supplieth, according to the operation in the measure of every part, maketh increase of the body, unto the edifying of itself in charity. 8 but they did not prevail and there was no longer any place for them in heaven. 15 The serpent,* however, spewed a torrent of water out of his mouth after the woman to sweep her away with the current. 16 But the earth helped the woman and opened its mouth and swallowed the flood that the dragon spewed out of its mouth. d [12:5] Is 66:7 / Ps 2:9.
e [12:9] Gn 3:1–4; Lk 10:18.
g [12:14] Ex 19:4; Dn 7:25; 12:7.